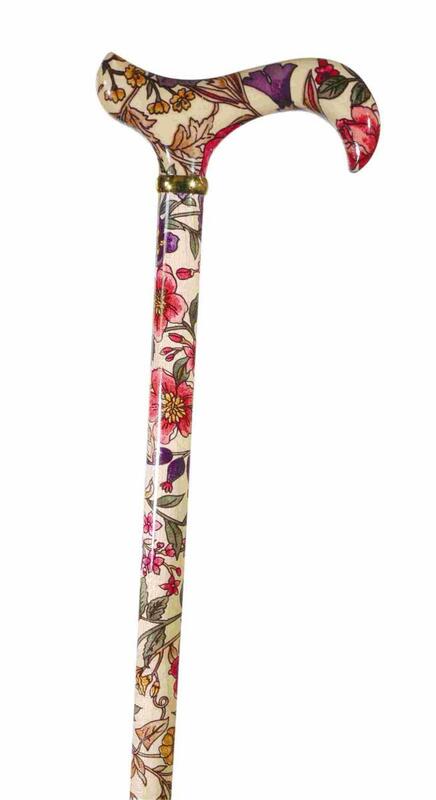 A very unusual and beautiful derby cane that makes a glamorous accessory to smart outfits. An attractive floral pattern has been applied to the pale hardwood shaft and handle by transfer and the shaft and handle then varnished. The derby handle offers excellent support to the hand, and may be hooked over the arm when not in use. A smart brass collar completes this beautiful stick. Fitted with a rubber ferrule. Ferrule diameter 16mm.